This is Halloween – Wait Your Turn! Halloween is without a doubt my favorite holiday of the year. I love the all the decorations that go up, the costumes, the candy. The overall feel of spookiness that permeates the air is quite simply intoxicating. You get all the horror movies to come on TV, from the cult classics like Hellraiser to the slashers like Friday the 13th to the thrillers like The Silence of the Lambs. Even the great Halloween movies for kids is great. We watched Hocus Pocus with my son the other day and he loved it. And I regularly watch The Nightmare Before Christmas to relive my childhood. You’ve got haunted houses left and right, along with haunted mazes and hay rides. Heck, they even have Zombie Paintball now. Everything builds up to one joyous night of scares and trick-or-treating. We’re planning to go with some friends and take my son around a neighborhood in St. Louis. And one of the joys is dressing up. So we were walking into Walmart last weekend to get my son a costume. He’s been watching Jake and the Neverland Pirates recently and says “Pirate” all the time. So, we figured a pirate costume was bound to happen, which it did. We even got him a little sword and hat to go with the costume. But here’s the problem. 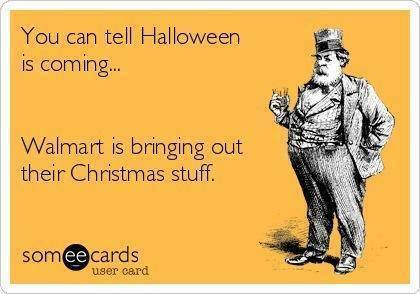 As we’re walking past the Halloween section (3 small aisles) to continue our shopping, I see the Christmas section. ARE YOU KIDDING ME??? Christmas? It’s a week before Halloween! We still have Halloween and Thanksgiving to go before Christmas even comes around. 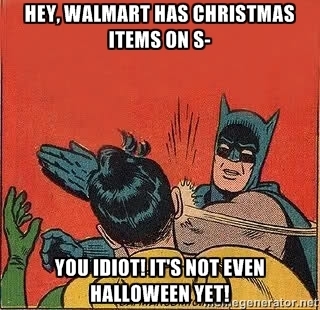 Why does Walmart already have Christmas decorations out? And not just a few decorations. Where Halloween got 3 aisles, Christmas gets a section bigger than the toy and electronics sections combined. Now, look, I understand the revenue companies make off Christmas sales is exorbitant, way bigger than Halloween and Thanksgiving. Probably bigger than the two combined. But what happened to showing some respect for those holidays and the people that love them. I mean, come on. Like I said Halloween is my favorite holiday. And Thanksgiving is my wife’s. But it’s like we skip right over those as quick as possible and move on to Christmas with its shining lights, wrapping paper, and gifts, gifts, gifts! Halloween used to be a time when you embraced the mystery of the world. When you experienced just a little bit of terror in order to break up the monotony of the year. Halloween is the kick off for the holiday season, not something to be brushed over so we can move on to “more important” holidays. I mean, come on folks, how hard is it to just wait a little longer. I’d be willing to be that if you waited until the day after Thanksgiving to start selling Christmas stuff, i.e. the dreaded Black Friday, you will still make a killing in sales. Why can’t we just enjoy Halloween for right now, instead of looking forward past it? This entry was posted in Uncategorized and tagged Halloween, Not Christmas, October. ← How Do You Find Time to Write?